With so many types of adhesive out there, it can be confusing trying to figure out which type is best for each purpose. However, there are specific bathroom adhesives out there which have specific qualities making them perfect for bathroom use. Taking the time to familiarise yourself with some of the bathroom adhesives on the market will save you a lot of frustration when you come to needing to use one yourself. Most adhesives promise a firm hold but with so many different types of surface in the bathroom, it’s essential to find the right adhesive for your needs. Because surfaces need preparing before applying the adhesive and you then have to wait for it to dry, returning to find out that you’ve used the wrong type can be a frustrating experience. Get it right first time with our guide to bathroom adhesive. To get straight to the point, a good bathroom adhesive should be waterproof, resistant to fungi and solvent free. These qualities make for an adhesive that can stand up to the conditions in a bathroom and hold their seal for years to come. Whether you’re plumbing a new toilet, sink, or shower into your bathroom, or repairing old and failing seals on your existing bathroom furniture, you’ll need to find a good waterproof bathroom adhesive. If there’s a crack in your wall or bathroom floor, water will manage to make its way through and can begin to cause more serious problems. A good sealant should prevent any water from leaking past the toilet, sink, and shower or bathtub. It should also keep steam and water out of electrical fixtures such as light fittings or switches. Silicone sealant is perfect for installing and maintaining the seals on bathroom goods. Silicone is stable at both high and low temperatures, so it can handle the constant changes in room heat that are common with bathrooms. Bathrooms provide the perfect environment for fungi and mould to grow, particularly black mould which can be hazardous to your health if it’s not treated or removed. Because bathrooms are usually the warmest and dampest rooms in the house, they are the most likely to suffer from mould growth. With this in mind, a good bathroom adhesive should be highly resistant to fungi and mould to make sure that it’s not providing an extra surface to grow on. A silicone sealant is one of the best bathroom adhesives available. 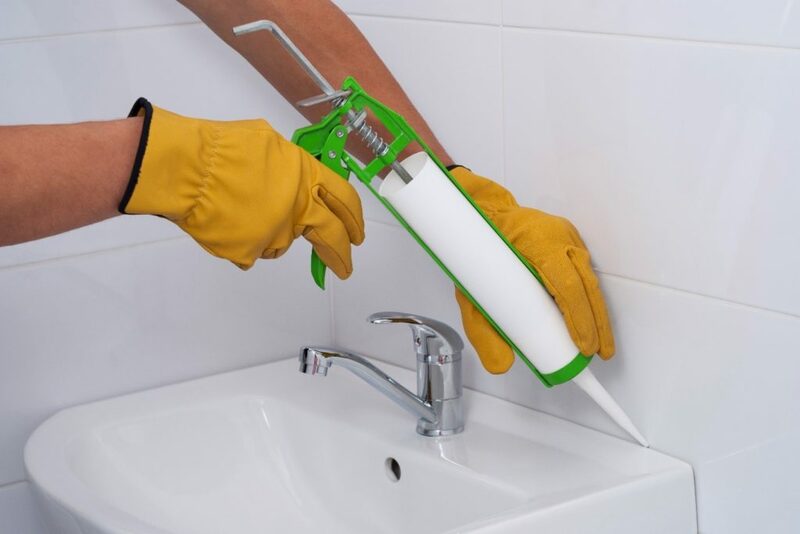 Due to the natural properties of silicone, silicone sealants are generally more resistant to mould growth than regular grouting, and some silicone sealants also have added fungicides, biocides, or anti-mould compounds for even more protection. There is still the chance that mould will grow on silicone adhesives over long periods of time, but you’ll find yourself having to clean or replace the sealant much less than you are used to. The final quality that you should consider in a bathroom adhesive product is that it should be solvent free. A solvent free adhesive is usually water based and contains 5% or less of solvent. They are generally considered to be more environmentally friendly than solvent based alternatives, and they’re safer to use in small spaces like bathrooms as they’re odourless and much less harmful to inhale passively. Solvent free adhesives are also reported to have a higher initial strength than adhesives made with solvents, so you’re not sacrificing performance for safety! Available in both clear and white varieties, a silicone sealant can be quite versatile meaning your choice can be determined by personal taste. Generally, however, people will choose to use white sealant if their bathroom furniture is white itself and then clear sealant if it’s any other colour. Now that you know what to look for in a bathroom sealant, you can feel confident that you’re making the right choice next time you come to seal something. Browse our range of bathroom adhesive today!